I love trying new ways to eat Brussels Sprouts – I could eat them morning, noon and night. But Brussels Sprouts for breakfast? I mean, I would do it, would you? 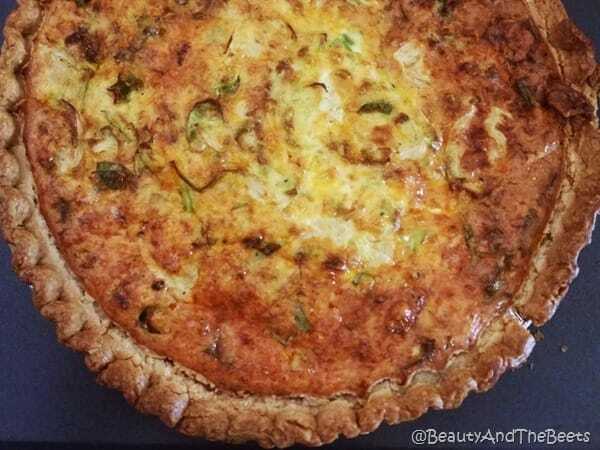 Well, wait until you try this – Brussels Sprouts Quiche. So I was sent a jar of Chosen Foods Avocado Oil Mayo to use in a recipe. Well, I do not use mayonnaise very often so I began to look through some cookbooks for inspiration. I found a few recipes that were interesting, and then I came across a recipe for a broccoli quiche. 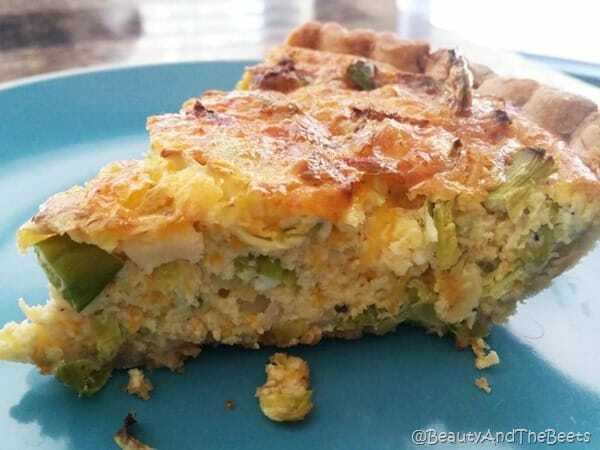 And if you can put broccoli in a quiche, then why not Brussels Sprouts? I was a very faithful fan to one brand of mayo growing up and if anyone used any different brand, I knew it. I could totally tell the difference. As I got older I began to use mayo less and less. With extra added sugar, modified potato starches and other ingredients I couldn’t pronounce, mayonnaise lost its appeal with me. But I really miss devouring a good egg salad sandwich. And tuna melts. 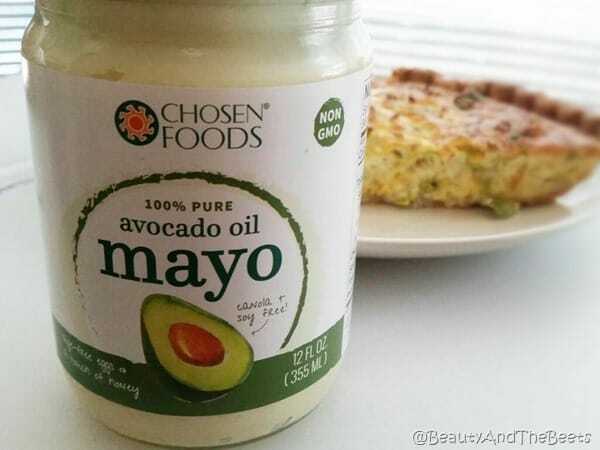 I did my research and learned that Chosen Foods Avocado Oil Mayo uses ingredients we all know- avocado oil, cage-free eggs, filtered water, distilled white vinegar, honey, mustard and rosemary extract. I began to rethink my personal ban on mayo. And then I decided to make something with Brussels Sprouts, for breakfast. And quiche came to mind. 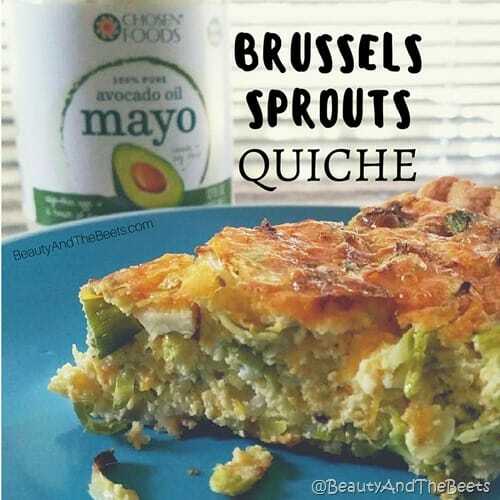 Brussels Sprouts Quiche to be specific…with Avocado Oil Mayo. I loved how this dish turned out. 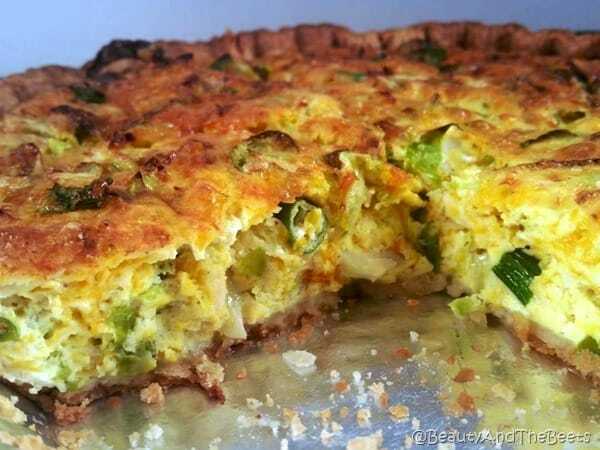 The quiche became light and fluffy by adding the mayo to it so I kept the other ingredients very simple – eggs, milk, mustard and seasoning along with green onions and cheddar cheese. I am still a big fan of Brussels Sprouts for breakfast, will this recipe turn you? Tell me what you think in the comments below! Who says you can't eat Brussels Sprouts at breakfast? Preheat oven to 350°. In a medium bowl, add the eggs, milk, mayo, onion powder, mustard and black pepper. Whisk until fully combined. Gently fold in the shredded sprouts, green onions and cheese. Pour into the frozen pie shell. Place on a baking sheet and bake 45 mins. Allow to cool a few minutes before cutting to allow quiche to fully set. **The easiest way to shred Brussels sprouts is by using the shredding attachment on the food processor. Just be sure to cut off the bottom of the stem first.